AzGA has several large floor maps (17 feet x 21 feet) that we are lending at no charge to educators. Please note that you must be trained and certified before you can borrow and take responsibility for the map and the auxiliary materials. 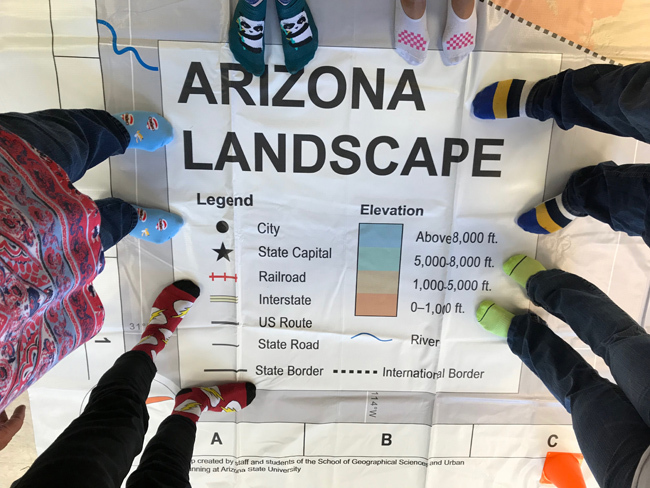 Please go to the AzGA home page and look under Upcoming events (lower right hand corner of the screen) for information about workshops at which you can become certified to borrow one of the Arizona Giant Floor maps. The map title is Arizona Landscape map. Click here for a printable image of the map. While grade levels 3-6 are suggested, these maps are useful for all grade levels. Please review the frequently asked questions , the booking availability calendar, and fill out a borrower request form to confirm a scheduled rental. Indicate your name, the school/group borrowing the map, contact and location information, and preferred dates on the form. Please allow at least two weeks from the date you fill out your request to the date of your desired reservation. When you receive the trunk and map, you will need to inventory the trunk. If you live in the Maricopa County area, please make arrangements to pick up and return the map to ASU in Tempe if you wish to use the map for no cost. If you live outside of Maricopa county, arrangements can be worked out with the borrower paying for one way of the shipping costs and AzGA paying for one way. To make these arrangements, call the AzGA office during normal business hours (8-5 M-F). Again allow plenty of time (at least 2 weeks prior to reservation date) to make arrangements for shipping. Socks are to be used at all times on the map. No shoes, no bare feet. This is to preserve and protect the map surface. When borrowing the map, you agree to complete an online survey for AzGA. We need your data in order to secure future funding to support teachers with maps and materials. It is important that you return the map when agreed so that the next teacher can receive the map on schedule. Pick up/drop off times for the map and its accessories are Monday through Friday, 8:00 am to 4:30 pm at ASU Coor Building, 5th Floor, Room 5677, 976 Forest Mall, Tempe, AZ 85281. AzGA office phone: 480-965-5361. If no answer, call the Geography Department office phone: 480-965-7533 for help in picking up or dropping off the map. How Do I Get Certified to Borrow the Map? What Kinds of Activities Can Be Done with the Giant Map? Want to See Where the Maps Have Been? Go to this Storymap http://arcg.is/2mBhXpg to see where we've trained teachers, and teachers have taken the map for their students to experience.